Under the HVNL, written work diaries (WWD) and approved electronic work diaries (EWD) are required for fatigue-regulated heavy vehicle operators. How can you best develop an EWD for your fleet? Globally and in Australia, fatigued and drowsy heavy vehicle drivers are a recognised safety hazard and a major concern for the road transport industry. Insufficient sleep, night driving and long work periods are all known causes of driver fatigue. Combating fatigue and reducing fatal road accidents involving heavy vehicles is enforced under the Heavy Vehicle National Law (HVNL); passed in most Australian states and territories in 2014. The National Heavy Vehicle Regulator (NHVR) is responsible for administering the HVNL in accordance with the Heavy Vehicle National Law Act 2012. In 2004, the Adelaide Centre for Sleep Research found that a person who’s been awake for 17 hours has the same driving crash risk as a person with a blood alcohol level of 0.05 (g/100mL); both are twice as likely to have an accident as a well-rested person with no alcohol in their blood. Worse, a driver awake for 24 hours straight has the equivalent driving crash risk as a person with a blood alcohol level of 0.10 (g/100mL), and is seven times more likely to have a crash. Under the HVNL, fatigue-regulated heavy vehicle operators, their employers and any party in the supply chain must ensure safe transport activities. As part of that, fatigue management, including driver compliance with specified maximum work and minimum rest limits, is enforced by the NHVR’s legal requirement of written work diaries (WWD) and approved electronic work diaries (EWD). Work diaries create an accurate daily record of an individual driver’s time spent working, driving and resting, including vehicle types, locations and distances covered, as evidence to obey the HVNL. As the approving authority for Electronic Work Diary systems that meet the requirements of the EWD Standards, the NHVR, as of 29 November 2018, are yet to approve any independent enterprise mobility systems, integrated vehicle telematics systems or electronic recording devices as EWD tools. Since 1st October 2018, all parties involved in transport tasks are now legally liable for heavy vehicle road law breaches, even if you or your company are not directly responsible for driving a heavy vehicle. Accordingly, consignors, consignees, packers, loaders, receivers, schedulers, as well as managers, directors, executive officers and corporate entities responsible for employees—all form an important ‘chain of responsibility’ (CoR) to ensure safe management of fatigue-regulated heavy vehicle operations. Thus, when approved by the NHVR, electronic work diaries will improve safety, enhance work planning and reduce lengthy paper administration tasks. Importantly, approved EWDs will provide a simple, secure and automated way to record work and rest hours for heavy vehicle drivers, as a legal requirement, and could provide access to more business intelligence data, therefore, becoming a real-time fleet safety, compliance and performance management tool. As a modern transport operator, integrating EWD functionality into your current enterprise mobility system or adopting an out-of-the-box approved EWD solution, will ensure you’re ready to meet your CoR fatigue management obligations. Such an EWD system must be built to Electronic Work Diary Standards as set out by the NHVR. Therefore, it may help to select an EWD-knowledgeable technology partner to develop a solution tailored to your needs and submit your candidate EWD system to the NHVR for approval. Installed telematics solutions, such as Geotab, extract vehicle usage, performance metrics and GPS tracking data via a device plugged into the computer system of a fatigue-regulated heavy vehicle. Such digital telematics solutions offer a convenient and automated way for the heavy vehicle driver to meet EWD requirements by collecting and recording accurate hours of driving, location and distance information when operating that specific vehicle. 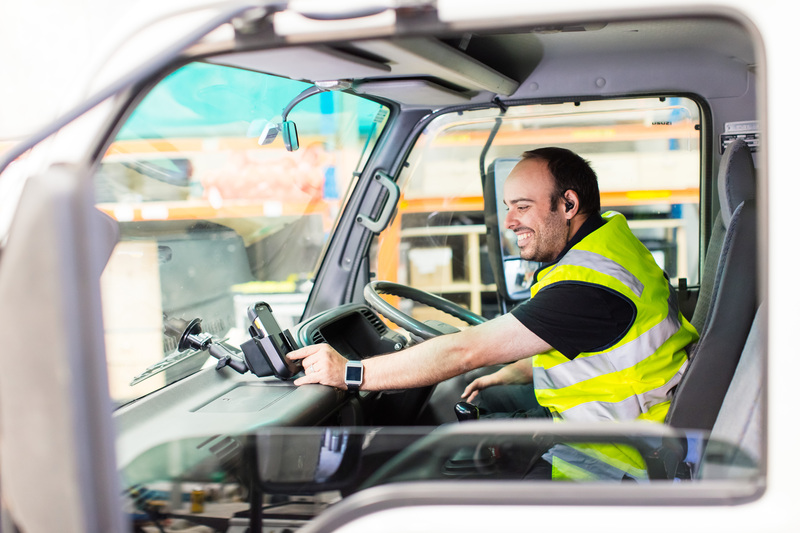 If the same driver is subsequently required to drive a heavy vehicle without telematics fitted, then a delivery tracking and fleet management solution, such as Leopard Delivery Cloud, operating via the driver’s smartphone and independent of the vehicle, could be used. This heavy vehicle driver tracking solution would log critical electronic work diary information for compliance, plus manage freight records and other logistics at the same time. For drivers without access to vehicle telematics systems, the Leopard Delivery App may offer an easy way to collect accurate EWD information. Sophisticated operations running complex vehicle fleets may well combine vehicle telematics and delivery mobility information to enable collection of EWD information in a consolidated and efficient way. In addition to productivity gains, Leopard Delivery has the capacity to intelligently extract, organise and manage EWD information from telematics sources and handheld equipment in compliance with NHVR’s EWD Standards. Leopard Systems technology providers are available to partner with your organisation and help design or update your digital record-keeping solutions to meet EWD requirements. For peace of mind that your drivers will comply with EWD legal requirements, and that your organisation’s CoR obligations to your supply chain are met – talk to Leopard Systems today. Find out what your organisation may need and speak with our specialists about implementing Leopard Telematics and Leopard Delivery for your heavy vehicle operations.